There are so many different ways to crochet circles. You can use crochet circle designs to make simple appliqués, coasters and bunting. But you can also use circles as the start of bigger crochet projects including hats, vests and round blankets. Of course, designs worked in the round come in as many patterns as the mind can conjure up, but if you know how to make really basic circles then you can go on to make almost anything. Here are a set of crochet circle patterns and tutorials that will teach you all of the basics. This is a detailed tutorial for how to crochet in the round, providing a great introduction to all projects that begin with a crochet circle. This crochet pattern is worked in single crochet with a slip stitch edging. You'll be able to crochet an easy round coaster by the time you're finished the tutorial. Make a few more coasters for even more practice, and then you'll have a complete set to use, and you'll have gained a valuable skill at the same time. 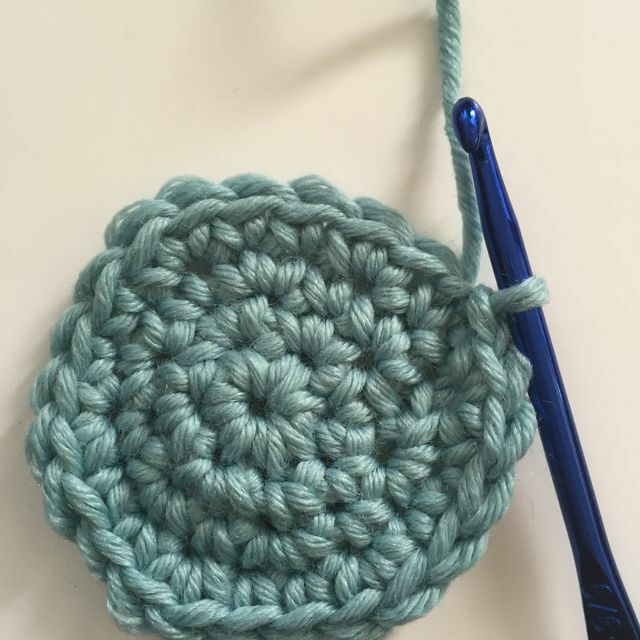 The key to making any crochet circle worked in the round is to understand how to increase in each round to grow the circle in such a way that it stays flat. The previous tutorial showed how to do that with single crochet stitches; the concept is the same for other basic stitches including the double crochet circle shown here. If you just want a quick, beginner-friendly little circle without any increases, this one is a great pattern to try. It's comprised of easy chain stitches and double crochet stitches, which are stitches that even a beginner can crochet. This tutorial shows how to make a snowflake-shaped trivet of circles crocheted over upcycled metal bottle caps. However, you don't have to make the whole trivet to get the hang of crocheting the easy circles. These circles could be used as polka dots sewn on to a larger projector in countless other ways. The tutorial calls for medium weight yarn and a size J crochet hook. Worked as such, this crochet circle measures just over 1.5" in diameter. The circle can easily be crafted smaller or larger by changing your hook and/or yarn size. Not all circles are crocheted in the round, although it's an easy and intuitive way to build a circle shape. You can actually make crochet circles working in rows. That is exactly what was done here, with a tapestry crochet pattern that uses increases and decreases to give you the round design. The heart at the center is a key piece of the design but of course you could make a crochet circle without a heart center, as well. What if you are working on a crochet pattern that requires only a half circle instead of a full circle? It's not common but it can come in handy to know how to crochet a half circle. This crochet pattern is intended for a purse; working it will teach you what you need to know about making half circles in crochet.